I am endlessly fascinated by people who name their children after public figures, especially when those names reveal a particular political or religious commitment. In the case of William and Rachel Smith of Wrentham, Massachusetts, that commitment was the abolition of slavery. Of their (at least) twelve children, three are sons named Frederick Douglass (b. 1851), John Brown (b. 1862), and Abraham Lincoln (b. 1866). The Smiths, one of the few black families living in a rural town near the Rhode Island border, owned a modest farm worth $350 in 1870 (their white neighbors' farms were generally worth $700–$2,000). Both William and Rachel were born free in Massachusetts in the 1820s. It's interesting that they have an Isaac Cato also. How does the use of Roman names for African Americans look after the abolition of slavery? Certainly names like Cato and Caesar were often used for slaves. Did these quickly disappear (suggesting they may have been disliked) or did they just gradually drop out of fashion along with other names of their time. My best guess is that classical names like Cato, Ceasar, and Pompey were much less prevalent after emancipation, but may have survived if parents decided to name children after grandparents/uncles/aunts, etc. 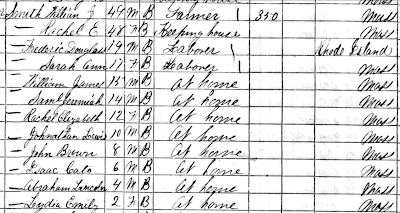 I took a quick look at the 1930 census and found about 1,000 people named Cato/Kato and around 300 named Pompe/Pompey, most of whom were born after 1870. Quite a few follow the family pattern — for example, Pompey Bates of Foxtown, KY (b. 1870) had a grandson named Pompey (b. 1930) living with him. I also checked the California Birth Index (1903-1995) and found several Catos and Pompeys born in the 1970s. I wouldn't be surprised if these babies were named for relatives. Since William and Rachel Smith named two children after themselves and three for famous men who had meaning for them, I would venture a guess that Isaac Cato may have been a grandfather, uncle, or community leader. I was just reading a book that mentioned that many black South Africans retain the last names September, January, and November. The names originally derived from the months in which slaves were purchased, but modern South Africans keep the names because they are now associated with memories of parents and grandparents.